Standard 4 pupils from Wekhonye Primary School using tablets to learn programming using blockly games, a series of educational games meant to introduce programming to students. Digital Communities Initiative is a year-long program to use technology to improve the livelihoods of different groups in education, agriculture, and entrepreneurship. These groups are local primary and secondary schools, women enterprises and agriculture-related groups. AMI is implementing this project in Wekhonye community of Trans Nzoia County from September 2016. 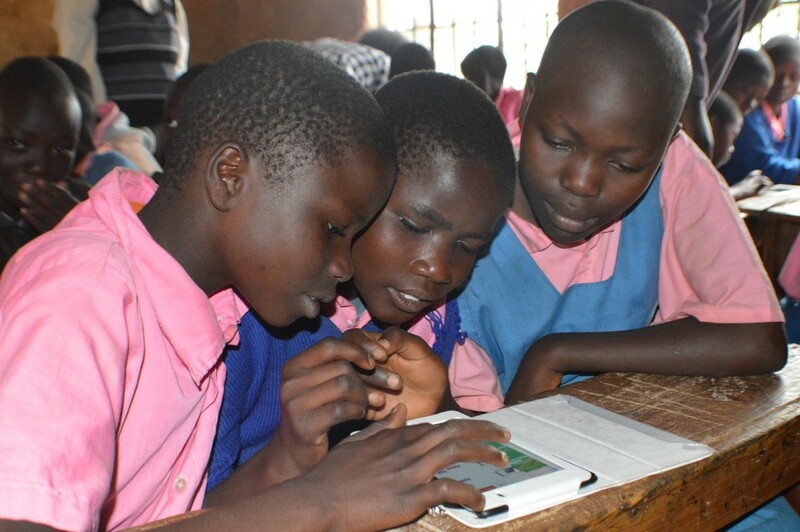 We have drawn on the experience and expertise of our members, local partners across Africa and further international experts to design series of interventions that will all be run using tablet computers and facilitated by local university students and NGOs. This unique program gives students and teachers to access a wide range of off-line educational materials which also includes educational games. Tablets are loaded with apps proven to help students improve basic numeracy skills, reading skills, and make a shift from rote “chalk and talk” learning to more learner-centered approaches. It is our hope that by doing this these students (primary and high school) will be given a strong foundation of basic education, something vital so that they do not get left behind in the future. These apps are from various sources such as Khan Academy, Blockly games, World Possible, One Billion among other sources. 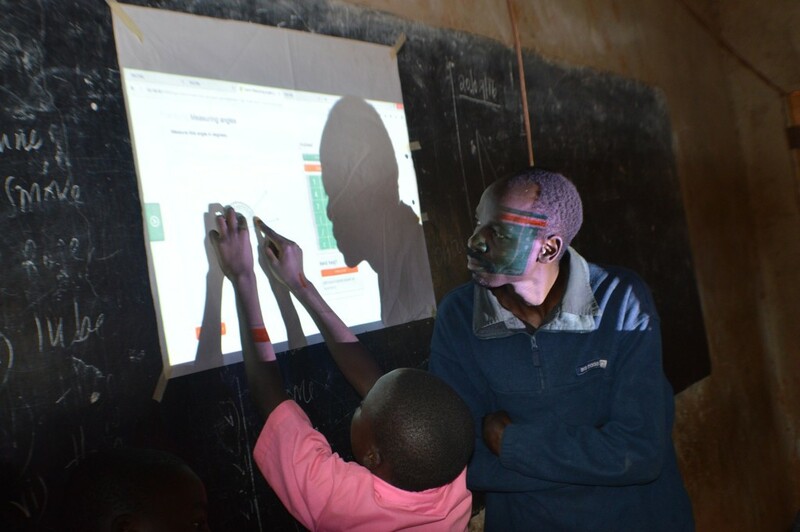 Mr Alex Anyova, a class five maths teacher looks on as one of his pupils' measures angles using educational materials projected from RACHEL. A similar set of interventions will be carried out in secondary schools, with a focus on raising aspirations and grades within STEM subjects. These areas have been identified as the biggest barriers to university entry and scholarships, and are vital to helping people in Africa develop the skills needed to solve complex problems facing the continent. We are placing additional emphasis on supporting girls who are often marginalized in such contexts, with additional events such as a girl’s coding workshop. Agriculture plays a huge role in local communities and is usually the main source of income for families. Rich catalogs of information and tools aimed at helping farmers already exist, however, access to such information is severely limited for the majority. Interventions will be planned and delivered to support farmers in their daily activities, such as using local climate data to make crop decisions, tools for budgeting, and access to informative videos. A large number of women in rural areas engage in informal business activities which hardly grow beyond the level of subsistence. Potential gains in these endeavors can have a huge knock-on impact on families, such as providing the additional means needed to send children to school or to access better healthcare. Tablets will be utilized to provide tools for financial management, planning,to and cooperation, collecting information and discussing possible solutions to improve understanding of risk. You can follow our story and update about this initiative on this website, as we work alongside an amazing team to make DCI a reality in Kenya's Trans-Nzoia County. This program is being supported by The Economist and SAMI.